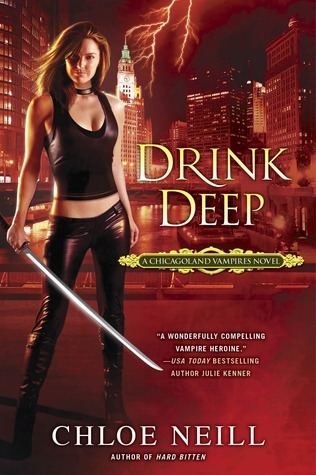 Drink Deep is book five in the Chicagoland Vampires series. This series revolves around Merit, a recently turned vampire trying to find her new place in life at Cadogan House. The previous book left us with Merit grieving over the loss of another vampire in her house. I wasn't sure where this one would go and hoped I wouldn't see a crying leading lady the entire time. After the events in the previous book, humans are not very pleased with the vampires and are protesting outside the House more so than before. Add to it that something is causing the lake to turn dark and the sky to turn red and you have some confused and pissed off people that think the vampires are to blame somehow. Merit and the others decide to investigate in an attempt to find the culprit before everyone turns against the vampires for something they had no part in. With no leads in sight, Merit winds up chasing her tail and issues just continue to escalate. Drink Deep left me needing the next book asap mainly because I need to know where the series is going to go now. I don't like when characters that die manage to come back to life so it pissed me off somewhat. I didn't see a lot of things in this novel coming so at least it kept me on my toes. I'll have to see how the next book plays out, hopefully amazing. If you're a fan of vampires in Urban Fantasy I think you'd enjoy this series. And this is the one I had quit at. lol I was SO freaking mad at the end of the previous one and all these years later still having given up my mad. One day maybe I'll be okay to try again. Ha! Still have to read the Chicagoland Vampires series, but I see what makes you upset. However, I'm glad you still enjoyed the book and I hope the next one is going to be really amazing! another series to try and I do believe I have the first book in the series too. Soon, soon, lols. Apparently it didn't piss you off too much. I'll stop reading a novel if the author really ticks me off. I'll wait a bit before I go to the next one but now I'm like hmmmm how will the author make this work? 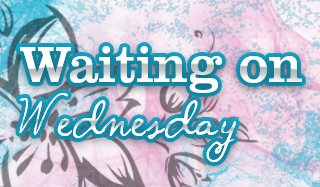 I'm more curious because I've seen other bloggers with similar favorites enjoy the later books in this series. lmao I'm so curious how it is after this book that I know I'll wind up getting it. I have been following the TV series, The Vampire Diaries, and they do have a lot of scenes where the dead came back to life. That though is kinda annoying, unless ofcourse it's my favorite character hehe. I'm a huge fan of Vampires and thanks for introducing me to yet another story! Oh yay, hope you love the series! I hope I get to read this at some point. Maybe when I'm back on the reading train again. Have a great week, Mel! i know it can be like a good cases at times that if a character dies and come back, but it doesn't sound like this is one of these cases. I actually quit this series after finishing this book. I hate it when a character dies and comes back to life. That was a deal breaker for me. It is different if you "think" they die, but if you KNOW they're dead, they need to stay dead. It will be interesting to see what you think going from here. I completely agree!! It was so frustrating. I'll probably grab the next one from the library just in case I get pissed off lol Will let you know how it goes!